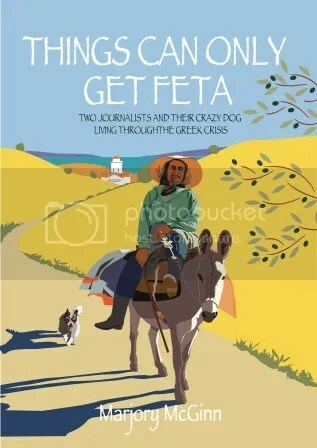 This week’s Q&A features Marjory McGinn, a Scottish-born journalist whose three years in the wild Mani region in southern Peloponnese during the economic crisis led to Things Can Only Get Feta, an inspiring travel memoir. Marjory’s love affair with Greece actually started in Australia through her friendship with Anna, a Greek girl, and continues to this day. As a Greek in love with my own country, shouldn’t I be super excited to have a chat with Marjory about her life and her work? After you read the Q&A, make sure you come back up here to link to MM Jaye’s Friends Write (my other blog) for a hilarious excerpt from Things Can Only Get Feta. Marjory welcome to my blog. We’d love to know a bit more about you and your interesting life. I think I’d describe myself as a fairly restless spirit who likes new experiences and challenges and that probably started as a child when my family migrated from Scotland to Australia where I was brought up. Aussies are adventurous and free-spirited and I am sure a lot of that rubbed off on me. As soon as kids leave school there, they tend to go on a big overseas trip which I did, too. I ended up in Athens teaching English for a year which is one of the reasons I developed a life-long love of Greece. Back in Australia, I started my career as a journalist on Sydney newspapers and I specialised in arts stories and celebrity profiles. Later I moved back to Scotland with my partner Jim and worked as a freelance feature writer for a few years before the travel bug hit again. In 2010, during a British recession, we decided to have an adventure in the remote Mani region of the southern Peloponnese, which inspired my non-fiction book Things Can Only Get Feta. 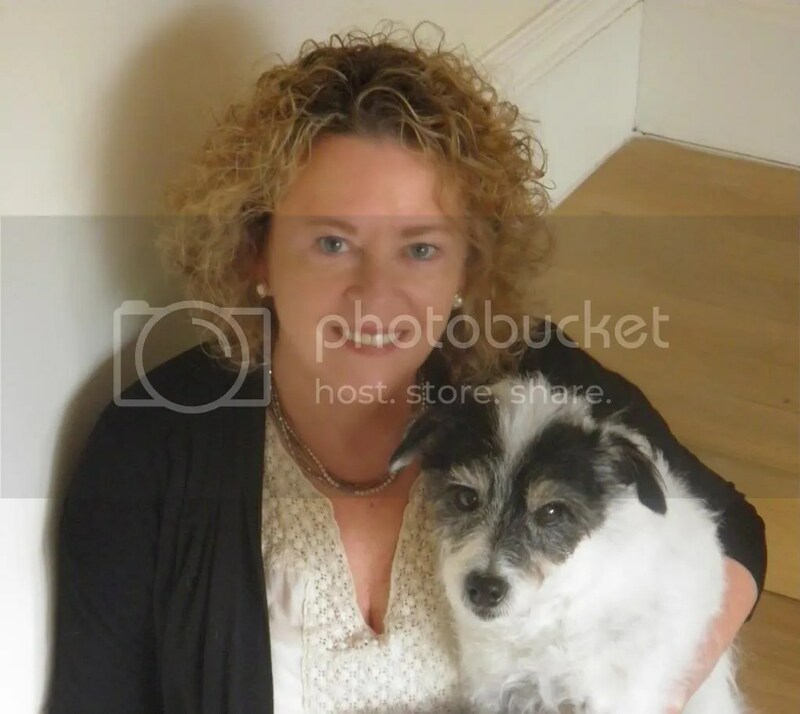 We took our crazy terrier dog Wallace along as well and that certainly guaranteed a few memorable incidents. Could you give us an idea of what your current project involves? I am currently writing a kind of sequel to the first book, which was about our first year living in a hillside village in the Mani in 2010/11. We ended up staying in this region for three years, so the sequel charts the final two years with a nearby, but slightly different, location and many more adventures and dramas as the economic crisis intensified, and a few other elements as well. That should make a very interesting read! Are you happy with the pace of your work? Do you aim for a specific word count each day? We are in the southern Peloponnese again for a shorter adventure this time. I had already started the second book while back in Scotland and I am now slowly getting back into it again. When you’re writing a book about Greece, it helps to be here for sheer inspiration: olive trees, birds, the sea in the distance. I am very laid-back about word counts and don’t set a daily amount because once I am in the mood I can write fairly quickly. Probably both. A non-fiction book needs a certain structure of course since it’s based on fact, but the rest of my book is narrative and involves experiences and the people I’ve met and I like that to be more unstructured, to flow just the way it wants to because even with a tight plot, as you know, elements pop into your head unbidden and you just can’t ignore them. A good travel memoir I think should read like a novel but be instructive and truthful at the same time, which is not always an easy thing to carry off. What’s your main enemy in getting that first draft finished? I think my main enemy here in Greece will be too many lovely distractions in the summer, like going to the beach, especially when it’s too hot to do anything else, and all the paniyiria in the villages in July and August which are always great fun. Have you experienced writer’s block and how do you overcome it? Having worked as a journalist most of my life, with tight deadlines, I have learnt to deal with blocks. I used to find that when my brain reached a dead end it was best was to walk away from the computer, walk around the newsroom, talk to people, and chill. Sometimes writers can try too hard to express themselves and that causes stress, and a block. Sitting and staring at a blank screen doesn’t help either, so my second tip is, if you really can’t get going, start writing anything – a shopping list will do, or a daft poem, anything really just to get words on the screen/page. Before long the piece you’re supposed to be writing will come to you. The trick is to get a flow going. That indeed is an excellent tip! Could we take a look at your workspace? My workspace at the moment is the balcony on the house we are renting for the time being. It has a fantastic view over olive groves to Koroni harbour at the tip of the Messinian peninsula. I have my laptop on the balcony table, a few books and nothing much else. Probably the tidiest office I’ve had for a while. It’s so peaceful here that I can’t fail to be inspired to write but I find it’s best to do it early, or later in the afternoon because the blue sea keeps calling me away. 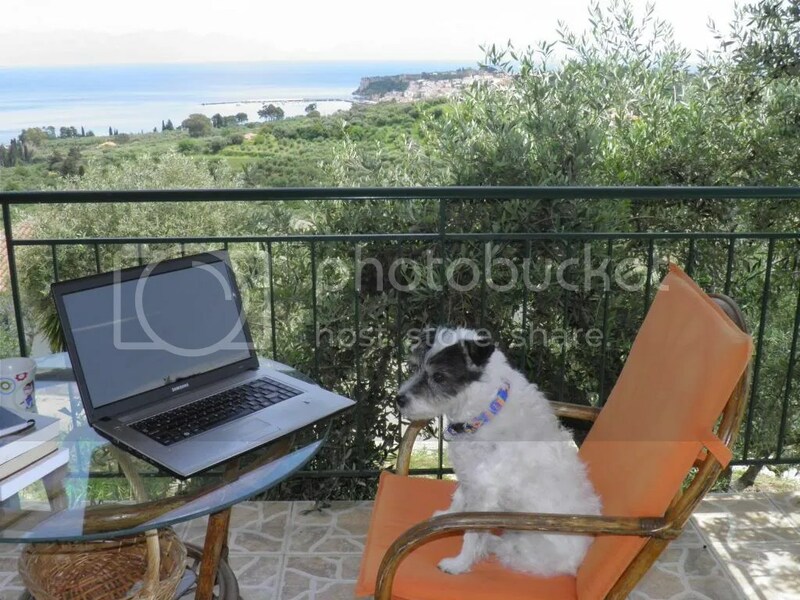 The only other problem is that our dog Wallace keeps stealing my chair and wants to know what I’m writing about him this time! Wallace is plain adorable! I’m sure many readers will envy your view. Now your photo is “pinned” on my Featured Writers’ Workspace Board on Pinterest. How do you intent to celebrate writing “The End” on your first draft? I think I’ll be rushing down to the sea for a long swim and later a nice meal in one of the lovely tavernas that line the harbour front in Koroni and a nice jug of local wine of course. Bliss! Idyllic. Which editing process are you going to outsource and which are you confident enough to undertake yourself? That’s one of the main points of this column; sharing and promoting services useful for indie authors. Which social media are you more involved with and why? I favour Facebook and Twitter mainly. My publisher is a small independent publisher and although he has done an excellent job in marketing and promoting the book, I think these days it’s a good idea for authors to do some of the promotional work themselves if they can. I think it is expected really, so I put regular posts on my FB author page and some on my personal page as well. I also use Twitter a lot. It’s fun and I think it works better for writers and gets your message out to a lot more people that you didn’t previously know. The great thing about social media now is that apart from making new friends, writers can connect with a lot of other writers and the possibilities for promotion are endless. Is writing travel memoirs the genre you will brand yourself with? I have enjoyed this genre and it has been very satisfying writing about Greece, a subject close to my heart and I’m happy to say a lot of Greeks contacted me after the first book came out last year to say it was a positive story about Greece during the crisis and that means a lot to me. But after writing a second travel book, I think I’d like to try a novel this time. I already have a plot roughed out in my head and I think I will enjoy fiction this time and really letting my imagination take flight. Where can we find out more about you and your work. I have a website called Big Fat Greek Odyssey which was started when Jim and I went to Greece in 2010 with information about Greece and the book and where to buy it. I also write a regular blog there with a Greek theme. Thank you, Marjory! Getting to know you and your work has been a pleasure! Thanks you, Marjory! I loved setting the interview up and learning more about you in the process! I hope I get to ruffle Wallace’s hair someday! He’s so cute! Wallace pretends to be cute. It’s all a ploy. Deep down he’s more terror than terrier! Thanks, Ekaterina! Can’t wait for your turn! I think your workspace view can seriously contest Marjory’s for the most coveted view of featured writers. That was very kind of you, Marjory, thank you! All interviews have been a treat for me as well! Such interesting backstories, and inspirations but also excellent tips for inexperienced writers! Hello colleagues, pleasant paragraph and nice arguments commented at this place, I am truly enjoying by these.